Management of Cluster membership is stalled during network partitions as described in a separate section below. 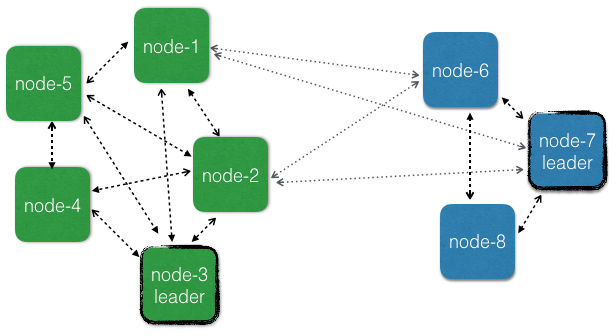 This means that nodes would not be able to be added and removed during network partitions between data centers. Downing/removal of nodes in the case of network partitions should typically be treated differently for failures within vs. across data centers. For network partitions between data centers the system should typically not down the unreachable nodes, but instead wait until it heals or a decision is made by a human or external monitoring system. For failures within same data center automatic, more aggressive, downing mechanisms can be employed for quick fail over. We often recommend implementing a micro-service as one Akka Cluster. The external API of the service would be HTTP, gRPC or a message broker, and not Akka Remoting or Cluster (see additional discussion in the Lagom Framework docs: Internal and External Communication Internal and External Communication), but the internal communication within the service that is running on several nodes would use ordinary actor messaging or the tools based on Akka Cluster. When deploying this service to multiple data centers it would be inconvenient if the internal communication could not use ordinary actor messaging because it was separated into several Akka Clusters. The benefit of using Akka messaging internally is performance as well as ease of development and reasoning about your domain in terms of Actors. The coordinator in Cluster Sharding is a Cluster Singleton and therefore, as explained above, Cluster Sharding is also per data center. Each data center will have its own coordinator and regions, isolated from other data centers. If you start an entity type with the same name on all nodes and you have defined 3 different data centers and then send messages to the same entity id to sharding regions in all data centers you will end up with 3 active entity instances for that entity id, one in each data center. This is because the region/coordinator is only aware of its own data center and will activate the entity there. It’s unaware of the existence of corresponding entities in the other data centers.